How Far is BM Serenity? BM Serenity is an Completed project It offers 2 bhk and 3 bhk apartments in different dimensions ranging between 1143 sq ft and 1602 sq ft. Located at HSR Layout in Banglaore.BM Serenity is near to Purva Faramount and DSR Pride. Location has a good connectivity to other places in Bangalore and has a residential ambience. This residential development has been approved with Cauvery and Borewell water. It has occupied a huge land of almost 30,000 sq ft which is under construction and will be soon available in market. It provides modern amenities like Landscaped Gardens which enhances the view and make it beautiful, Play Area for toddlers, Amphitheatre, Multi Purpose Court ,Jogging Track , well equipped and modern Gymnasium, Fire Fighting System, Exotic Swimming Pool, children's play area, special security features for the residents of BM Serenity and there is much more to be explored in BM Serenity. Ceramic dadooing in the kitchen upto 2, above the platform. Flooring-Ceramic tiles and dadooing upto 7 designer bathrooms with Branded Sanitary ware ISI CP fittings, provision for Geysers and Exhaust fan. 3 Track powder coated Aluminum windows with safety grills. Individual walls for each apartment. Provided with automatic load controller each flat, Lift and common area. 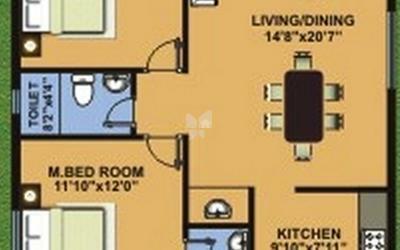 Telephone and Television points in living and master bed room with AC Points. 02 Nos. of 6 Passenger capacity automatic Lift. Concealed conduction with PVC Insulated copper wires, modular switches, ELCBS ETC, ANCHOR switches, security intercom to each apartment.